In case you didn’t believe me about the hidden location of the rear door handles on our rental Chevy Crapmobile, I have included this. Do you see the handle? Door handles are cunningly concealed on the awesome Chevy Crapmobile. Our second day here was a “down day.” We awoke rather late. I took a shower and then went to our outdoor kitchen on the lanai to make breakfast. Casey, whom we hadn’t yet met, came by to see how we were doing. He explained that he hadn’t yet purchased my requested decaf coffee. “Decaf is kind of heretical in Kona,” he explained. “But I’ll put on a disguise and find some for you.” I said he could forget about it, figuring that I was in Hawaii, so how bad could my blood pressure get? I fixed myself a 6-cup pot of Kona coffee and drank all of it, and I am still alive. Casey has long, white hair and a long, white beard. He told us that they were living in Seattle and had visited Captain Cook on vacation. They asked themselves why they weren’t living in Captain Cook and couldn’t come up with a good explanation so they moved here. He later delivered the decaf, but by that time I had decided to go with the local custom and drink full-bore. There were a few issues at first with regard to breakfast. Our hosts had thoughtfully provided eggs and sausage (this is a B&B, but obviously we are expected to cook our B ourselves), so I chopped some sausage and scrambled eggs in a bowl before discovering that the camp stove wouldn’t light. Tom, brilliant man that he is, discovered the location of the gas tanks (they weren’t obvious) and turned the gas on, so that was all right. I could not find sugar for my coffee, but Joan found us some later. (I used brown sugar from the fridge, which worked fine.) I toasted some croissants, made Tom some tea, and we had a lovely breakfast. Joan reappeared so that I could ask vital questions such as does Hawaii have ants (yes) and where the recycling bin was (if it was a snake it woulda bit me). After breakfast, Tom and I sat at the table, each absorbed in our work. I wrote yesterday’s blog post and cursed at various apps for not working the way I wanted them to. Tom–I’m not sure what he was trying to do, but I think he was working. I kept interrupting him with my app problems and he kept patiently solving them. This is why we have been married for 43 years. We didn’t have apps or iPads or iPhones–or come to think of it, personal computers–back in the day, but the principle is the same. I should explain that I am trying to do everything on an iPad. I have a laptop, but just didn’t want to haul it around and have to demonstrate to TSA that I am not a terrorist. (Inclusion of this word will probably interest the NSA. Have fun, NSA. It’s only money.) I am finding that an iPad, which I normally use for reading books, searching the Internet and following Facebook, has certain limitations when you’re trying to manage a bunch of social media streams. In fact, it’s crazy-making. Now that I’ve mentioned the NSA, it reminds me that when I opened my suitcase after our flight yesterday, a sandwich bag of nutritional supplements that I had packed first (and was thus at the bottom of my suitcase) was now on top of my clothes and had been opened. There was no note from TSA to say my luggage had been searched, not that they always leave billet doux when they search. Or it may have been an airline employee looking for free drugs. If so, I hope my calcium tablets gave him a sweet high. The whole thing was disturbing, in either case. He knows he’s beautiful. Or she. Then Tom reappeared, having washed the dishes. He needed to rinse his hair and T-shirt because a gecko (not the one outside our bedroom) had, um, eliminated over Tom’s head and hit his hair and shirt. 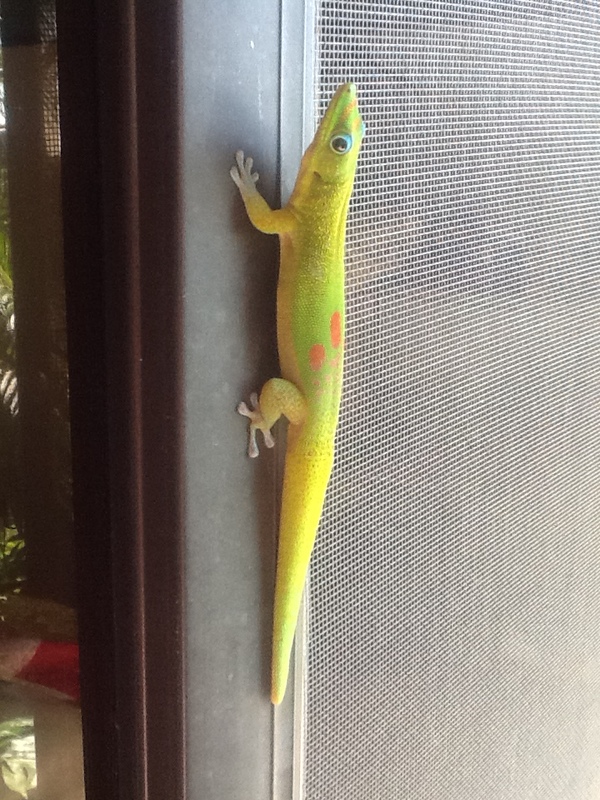 So apparently geckos have a lot in common with seagulls. Speaking of which, did you know that there are no seagulls in Hawaii? That seems almost impossible, but it really speaks to the geographical isolation of the islands. Not that I miss the seagulls, mind you. Instead, they have little blue doves, adorable little blue doves that make a satisfying jungle-y sound. We finally finished our self-appointed tasks and headed out. By this time we both were thinking about lunch, and it was mid-afternoon. We first went to a the Oshima Store where our hosts told us we could purchase various items we had neglected to bring. Our GPS systems told us all sorts of nonsense. Finally, I glimpsed some Hawaiians walking by the highway. Tom stopped the car and I leaped out and pursued them. They kindly stopped and I asked them where Oshima’s was. They told me and sure enough, there it was. Oshima’s is a genuine general store; they carry a bit of this, a bit of that, heavy on fishing tackle, light on organization. So it took a while to find everything, but we finally paid and left. Then we decided to get lunch at Da Poke Shack. Poke (pronounced POH-kay) is chunks of raw ahi (sushi-grade tuna) with spices and usually lime juice and coconut milk over rice. It is absolutely delicious. Tom and I had it the first time on a motu (little island) in Moorea. Our guide prepared it on the beach and it was nectar of the gods. At Da Poke Shack, they had a wider selection of sauces and grains, but it was late in the afternoon, so we had a limited choice–some of which disappeared while we waited. Tom got sesame poke and spicy garlic poke over brown rice and I got the spicy garlic and “Pele’s Kiss” poke over brown rice, both with edamame (steamed soybean pods). Pele is the Hawaiian goddess of fire and volcanoes, so it is fortunate that I enjoy spicy food, because there wasn’t a lot of choice–by this time it was 4:30 pm, and we were the last customers because Da Poke Shack had literally run out of food. We stopped by the Choice Mart to pick up some dinner fixings. 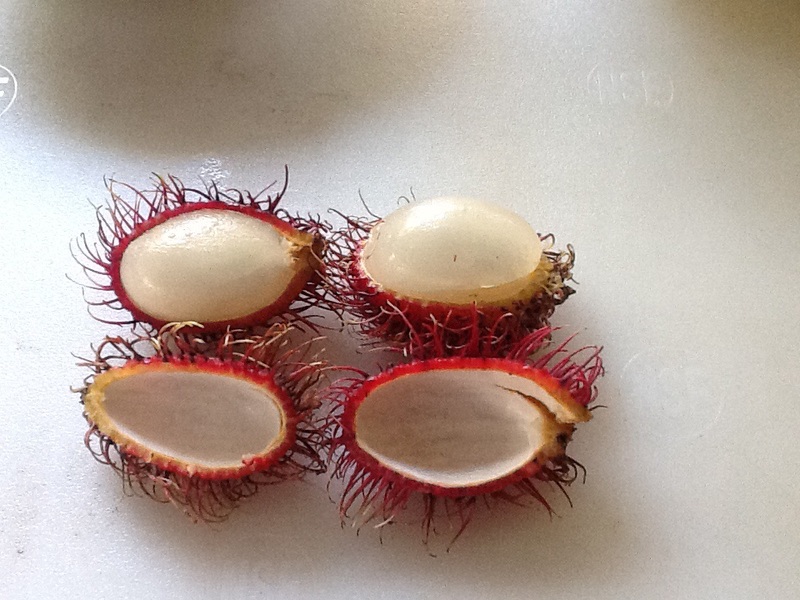 We saw these rambutans and couldn’t resist buying some. I’ll report on how they taste later. I like that they look like Klingon food. We purchased two monchong filets that we would never see in a store at home (and according to the label, aren’t that common here, either) and some salad fixings. Several times, I was tempted by something like asparagus, only to find that it was in the neighborhood of $11 per pound. Anything that has to be flown in is hideously expensive. On the way back we were astonished to see a flock of wild turkeys. One of the males walked right up to the Crapmobile and began a mating display. The Crapmobile was cruelly unmoved. 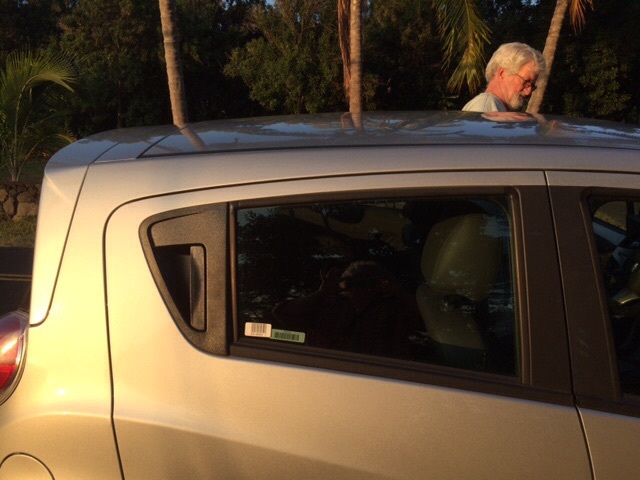 Different species, I guess–though “turkey” would be a good descriptor for the car. We got back just before sunset. I put the food away and then we both decided that we were still full of poke and didn’t want dinner. We sat on the lanai with our wine and played cards. Joan came out with a red banana she called a Cuban red. Later, she reappeared with sliced Cuban red on a plate. It was starchy but flavorful, with a faint citrusy tang. Still later, she offered us some champagne, which we accepted with delight. She served it in the prettiest glasses, tall flutes etched with a bamboo pattern. I guess she likes us if she’s giving us bananas and champagne. Interestingly, we have never seen Joan and Casey at the same time. My writer’s brain began working on a story about a Hawaiian kupua (shape changer). Then I made it stop. One story at a time, brain! This entry was posted in Fantasy, Fiction, Personal Stuff, Publishing, Writing and tagged author, fantasy, gecko, Hawaii, journaling, K.D. Keenan, kupuna, legends, mythology, novel, rambutan, The Obsidian Mirror by K.D. Keenan. Bookmark the permalink. I think the detail you put into your daily blog could entertain me all day. Beautifully done. Apart from the work I hope you have a Wonderful time. Thank you, Lord D! Day 3 was a bit disappointing, but stay tuned for Day 4. I’m American, so automatically thrilled by rank that we don’t aknowledge. And I love nicknames. So Lord D you are to me, my dear Lord D! Hope you can live with it ’cause it’s truly affectionate.